Let’s first define a function. 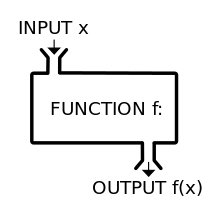 In mathematics, a function is a relation between a set of inputs and a set of permissible outputs with the property that each input is related to exactly one output. An example is the function that relates each real number x to its square x². A function f takes an input x, and returns a single output f(x). One metaphor describes the function as a “machine” or “black box” that for each input returns a corresponding output. Payoff is the outcome, or output of the function. Asymmetrical payoff function is a function graph that shows a positive asymmetric payoff. It could also be a negative asymmetric payoff, but we mostly use the term “asymmetric payoff” to speak of positive asymmetry. An asymmetric payoff is a situation in which the settlement valuation on a security changes in a way other than a linear increase or decrease. It is a non-linear increase or decrease. Options are common instruments with asymmetric payoff. A call option has a limited risk of the premium paid for the option, but unlimited upside profit potential. Some options strategies have negative asymmetrical payoffs. For example, selling a put has a limited profit but unlimited loss. Forwards, on the other hand, generally have symmetric payoff. Asymmetric Payoff is more profit than loss. Asymmetry of a trade (asymmetric payoff) is when the downside is limited, but the upside is unlimited. What is an asymmetric payoff or asymmetric investing? An asymmetric payoff may refer to the probability or potential or expected outcome of a trade or the actual outcome of the trade of investment. Asymmetric payoff is the upside potential is greater than the downside loss. Asymmetric payoff is the upside potential is greater than the downside risked. For example, you risked $1, but earned $2. Or, you expect to earn $2 when you risked $1. Asymmetric payoff is the upside probability (a mathematical calculation) is greater than the downside loss or risk. Asymmetric payoff is the outcome of a trade has more profit than loss . As you can see in the graph below, asymmetry is preferred over symmetry: (symmetry is when your risk and reward is balanced, so the outcome for profit is the same as the outcome for loss.